Remember Four Natures last year? It was just four of us, working in paper, clay, metal and wood. Now it's been two weeks Into Nature (7 of us now!) in this gorgeous TripleOne Somerset space, sharing our works with the world! I always look forward to Christmas because it's definitely a time of reunion and happy spontaneous meetings with old familiar faces and new friends. This year Joanne from The Letter J Supply once again plays the generous hostess with the mostest by opening up her space to others, where like-minded friends can gather to collectively showcase our handcrafted works and different journeys in craft and design across different mediums. Into Nature represents us as a Craft Christmas Collective, where each of us brings our own individuality and creative expression through craft, inhabiting a space where anyone and everyone is invited to explore and discover our processes through conversations with us, the makers. It's been wonderful as well for us to share our stories and personal journeys with you, very often, I feel like it's more important to talk face-to-face with someone who is looking at what I've done and this space has given me a great platform to. I also had my first Star Spoon carving workshop here! It was uber fun and a joy to see others enjoy woodcarving too. Five stars arising....out of the stormy sea (of wood shavings). 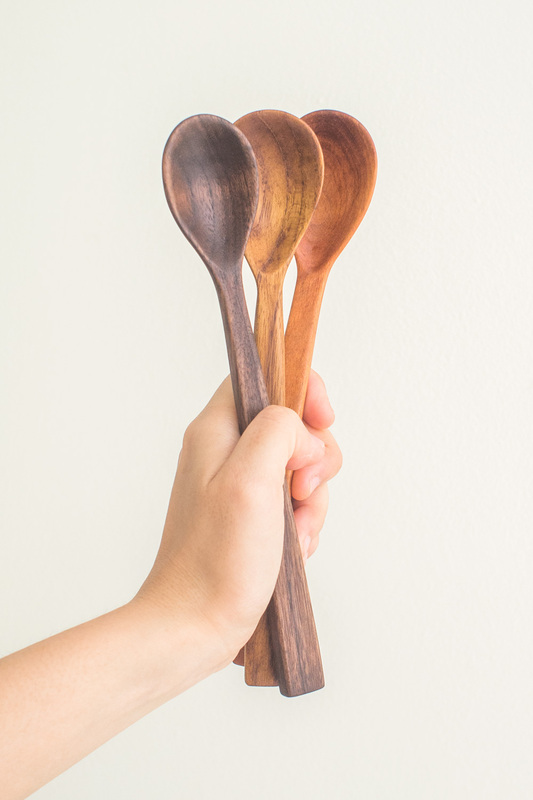 Five very different star spoons shaped by patient hands, and infused with their own design and personality. What better way to make something truly yours than to carve it yourself! Last weekend I also brought down my first batch of wooden whittled brooches in teak, cherry and maple wood. I hope they can serve as reminders of what we have to enjoy, a safe home, peace and freedom. I'm not sure what the ducks can remind one of...maybe how things go swimmingly if we swim with the right wave? Forgive me, I like to read into things a little too much sometimes. This is Eden Yow, a little man with an epic beginning and an even bigger future ahead. To see him in person and see him break into a toothless smile every time a stranger waves hi to him...priceless. Gracie was one of the guest vendors last weekend, and wrote a short post about Eden's birth. This guy is a real trooper! Two more weeks into December and 12 more days to Christmas, everything so far has been a testament of God's overflowing goodness and grace. More joyful things to come! Thank you God, for the sustaining me through the times I had much left to do, and little sleep through the day, for family and friends who gave me that extra boost of encouragement when it was much needed. When I was feeling upset and under self-doubt, your words comforted me. There is no greater sweetness than to remember how your goodness carried me through my lowest points. Amen. One character that found its way to my head and wouldn't go away as I was thinking of a concept to tie this pop-up together. This was the first time The Little Dröm Store, Usually Usual and myself would be working together. Looking back, it wasn't by pure chance that this opportunity to work together arose. For Chloe Usually Usual and myself, I first met her at Makers of Singapore event at National Design Centre in 2013. It took FOREVER to choose between the porcelain bowls she had made because they were all so beautiful. It was the first time I had seen unglazed hand-thrown porcelain wares and they were uncannily perfect for my slightly smaller hands. Till today, I still use them for my breakfast cereal and for snack breaks. Soon after, I had a booth at Public Garden, and she dropped by and bought some wooden Parfait Spoons from me. Our conversation began with a fascination of each other's craft and passion for it, and I'd say that's where our friendship took root. I visited the Weekend Worker ceramic studio and have been learning ceramics from them ever since. For The Little Dröm Store, as a student I often visited their shop back in Ann Siang Hill, just being in the space and being awed and amazed by their work and collection of memorabilia, but never really speaking to them in person. It was in recent years that we realised we had mutual friends and similarly shared many other things and interests in life. Well, back to the pop-up and how it got its name. Maybe it's me, but I like to over-read into seemingly simple things. I definitely wanted something that would complement The Little Dröm Store's dreamy playful vision and ground it in something familiar and understandable to everyone. Like a meal, how about the first meal of the day, breakfast where people say good morning to each other? 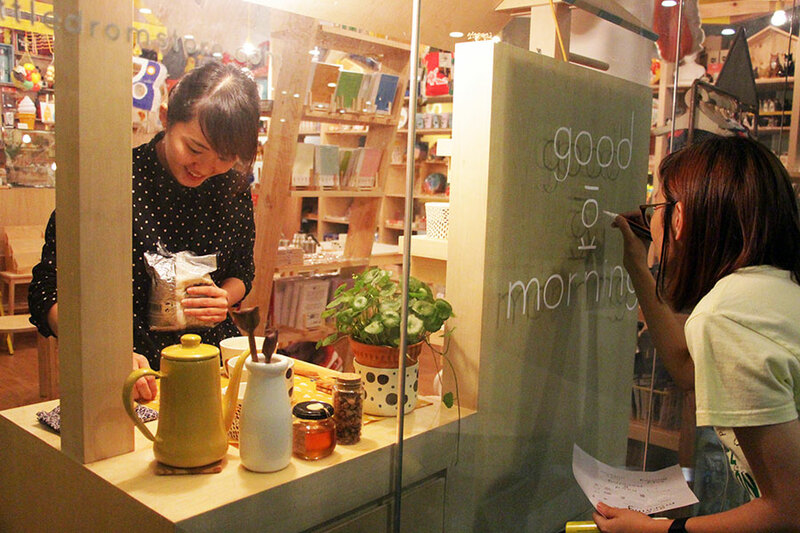 In Japanese-English, 'good morning' gets its syllables stretched out to sound like 'goo-dou moruningu'. I thought it was nice how it sounded like each other. It's actually quite a pleasant greeting, but I rarely hear it anymore, unless I'm visiting a commercial establishment or cafe in the morning. Often, I'm also guilty of just going with the mundane flow of getting out of bed and to work, that I forget to wish my parents a good morning. Morning are precious aren't they? It's a fresh start to a brand new day, why not savour it a little more? That's how we created a workshop experience around one's morning, EVERYDAY COFFEE SCOOP. Handbrewed coffee served in her porcelain wares and woodcarving, which naturally demands you to slow down and enjoy the process of it. 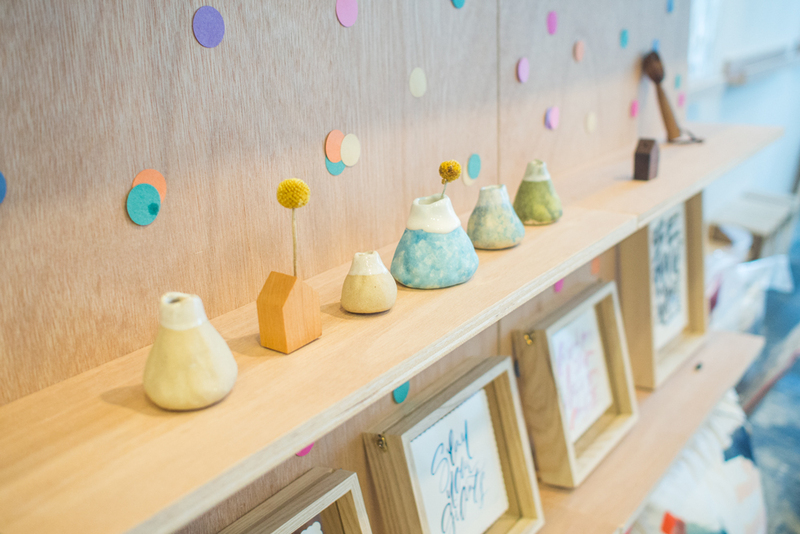 We wanted participants to walk away aware of how good it feels to slow down just a little, and how handcrafted wares and the making of it made a difference in that mindset. So here we were, late on a Friday night, setting up the pop-up retail booth at The Little Dröm Store. They basically gave us free reign to draw all over their glass facade, which we were more happy to! Photos taken by the lovely Antoinette. Mame in Japanese doesn't mean just seed, it can also mean sincere diligence. And it's true of everything. Something good must start with a seed, something very small that may be invisible to the eye at first. Of heartfelt hard work, of appreciation, of mutual respect, of gratitude. Soon, with patience, time and care, it can nurtured into something stronger and is able to bear fruit. I guess this pop-up and collaboration together parallels that journey, and of course I hope that it will continue on to more exciting things in the future! I'm humbled to be part of this pop-up collaboration with such talented and hardworking craftspeople in their own field! We've just finished our first-ever round of workshops held at The Little Dröm Store and every session has been absolutely scary and wonderful at the same time! To tie in our Good 豆 Morning Pop-up theme to the workshop, we focused on two parts: enjoying and learning about handbrewed coffee from Chloe (Usually Usual), and teaching participants how to handcarve wooden coffee scoops for themselves (Everyday Canoe). What better way to start a workshop than with freshly brewed coffee, right? Spotty, dotty and beautiful porcelain hand-thrown wares Chloe made for serving the coffee in. Illustrated guide that explained the steps to carving! I really thank God that every participant has been a joy to teach, were really willing to learn and put their entire focus in carving their wooden coffee scoops out till the very end! It was also a good chance to show them my work process and let them get hands-on in creating their own scoop. I hope the workshop also helped them understand that making handmade wares isn't just a fleeting trend, it's really about internalising that into the way you see objects and the way you appreciate how things are made, into your life. That appreciation goes a long way in sustaining creativity and growing our local creative community. Making something by hand can be challenging and time-consuming, but the satisfaction and awareness you get about the process (as well as respect for others who also take years to hone their craft) is like no other! Photo Credit: Antoinette from The Little Dröm Store!